For everyone who's asked for a simple cupcake recipe, here you go! To melt the chocolate, place in a double boiler over simmering water on low heat for about 5-10 minutes. Stir occasionally until completely smooth and no pieces of chocolate remain. Remove from the heat and let cool for 5-15 minutes, or until lukewarm. In a large bowl, on the medium speed of an electric mixer, beat the butter until creamy, about 3 minutes. Add the milk carefully and beat until smooth. Add the melted chocolate and beat well, about 2 minutes. Add the vanilla and beat for 3 minutes. Gradually add the sugar and beat on low speed until creamy and of a desired consistency. I made the vanilla cupcakes with chocolate buttercream from these exact Magnolia recipes. While the flavor of the cupcakes were awesome (just like I remembered when I ate this exact cupcake last summer at Magnolia in NYC) I was not happy with the outcome of my chocolate buttercream. It was really runny for some reason, and I couldnt get it to the thick, yummy and sugary consistency that it should have been. While it tasted it good, it was not the correct consistency. I wanted to add extra powdered sugar to thicken the frosting but was afraid of ruining the recipe. Would this have ruined it or thrown off the flavor? My kitchen was rather warm when I made the buttercream. Could this have affected the outcome of my frosting? I also tried putting the icing in the fridge to set up, but this didnt work. Does anyone have any tips or help to offer me as to why my buttercream wasnt right? I followed the Magnolia recipe exactly and was pretty disappointed when it didnt turn out right. I really want to try and make the buttercream again. Im going to make the chocoalte cupcakes with vanilla buttercream next, and I hope this batch of forsting turns out better than the chocolate one did! Any tips would be appreciated! Thanks! I have found that cupcake bakery recipes that go "on air" like Sprnkles or Magnolia Bakery never turn out the same. Ive tried all the Sprinkles recipes. Do we really think they are going to release that kind of intellectual property? Heck no....So they've altered them in some way for sure. I have made these cupcakes several times and make it as a 9" round two-tiered cake as well. You really don't need all the milk to be honest....and you don't use all the sugar that way. Adding more sugar does not change the flavor at all, helps to thicken as needed, etc. These are dead-on to the ones at the bakery in NYC. I go there every spring for a business trip and make sure to stop in to get "the real thing." However, this recipe is the real thing. I prefer the vanilla cupcakes with the regular buttercream frosting...added food color to make them fun. You really can't go wrong with the frosting. Just play a little with the amount of milk and sugar...and don't worry about adding more sugar to make it the right consistency. The first time I made them I ended up having to use 13 cups of sugar as apposed the 6 - 8 the recipe calls for to reach the correct consistency. Needless to say, cutting the milk down by half helped that problem. Enjoy them! I have my own cupcake catering and delivery service. I can not tell you how many times I have made this Magnolia cupcake recipe (at LEAST 15 times). It consistently bubbles up and forms crystals of sugar that sticks to the rims of the cups of the pan. Its never a pretty site. This certainly can NOT be the actual recipe. There is no way- and I agree- they would never really reveal such intellectual property. This cupcake recipe is a throw-away. Don't use it. Both frostings on the other hand are good and usable. I was so excited to try this recipe for the vanilla cupcakes! I had high hopes and don't get me wrong.. they were really good, but in the end they tasted like they were made from a box. And... if they taste like that - I think I'll be calling Betty Crocker next time instead. The icing was great and perfectly enough for 24 swirled cupcakes (SIZE 1M tip). I only used 1 stick of butter though - I thought the extra stick was just too much! The icing was GREAT. Hi, I just saw a video on youtube (epicurious channel) in which Magnolias Bakery's owner makes vanilla frosting. She made a different recipe from the one posted on your site. She used a flour/milk base mixed in with tradicional vanilla buttercream, that why its less runny. why in Europe cupcakes are not that popular???? My grandmother use to make a very plian, spongy one, with no icing. delicate in taste and they stay soft and sweet for weeks! For those of you having trouble with the recipe, try the cook book published by the Magnolia Bakery. I use the vanilla cup cake recipe to make a 9" layer cake and I use the chocolate buttercream recipe to top it off - its a winner everytime! Follow the directions exactly -don't cut corners and you will have a successful treat! 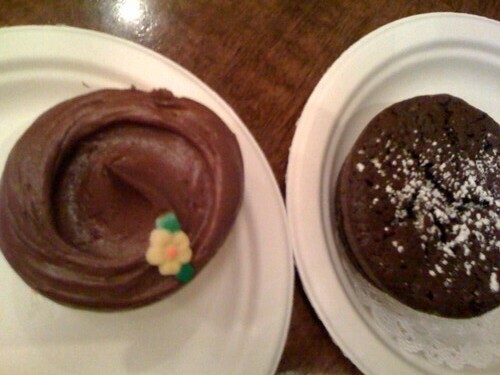 I had one of these from Magnolia Bakery in NYC the other day. I know why people have problems with this recipe and Amy's. It's because it isn't their actual recipe. But I am sure they wouldn't want that to get out. I know one thing that can be subbed and one thing to be added and it's a long time stander for baking from scratch. I will be trying this with the changes and I HOPE it's a better outcome then Amy's. The given recipes are very easy to follow and the ingredients can be easily found by those who want to try making a batch for their family or friends. It may be difficult to finish a whole cake but for cupcakes, you can have as many as you want from your favorite bakeries in Knoxville TN as long as you keep it in moderation. During your free time, try making cupcakes by yourself and you will appreciate it more because of the effort that you have put into each piece. Thanks for sharing!